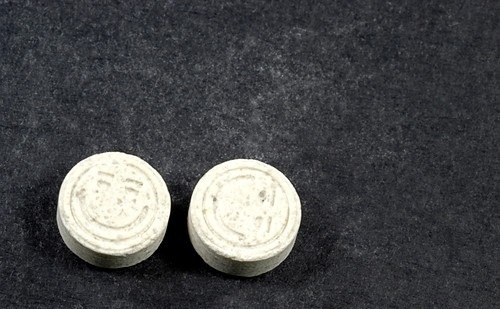 Over a dozen ravers were hospitalized at a weekend party after taking MDMA tabs that were laced with para-Methoxyamphetamines, or PMA for short. PMA is a serotonergenic drug synthesized from anethole, which is easier for crooked chemists to get a hand on then then safrole, the starting chemical used to make MDMA. The drug poses significantly higher health risks than MDMA while providing a far less pleasurable high. It's like coming up but never arriving, a sensation that has a way of convincing people that they'll finally get to their destination if they just pop another tab. Unfortunately, the dose response curve is steeper than ecstacy's. While lower doses can have a euphoric effect, higher doses are known to cause nausea, vomiting, severe hyperthermia, unpleasant hallucinations that can overpower whatever euphoric effect the drug might have, tachycardia, hypertension, agitation, confusion, convulsions, the severe breakdown of skeletal muscle, cerebral hemorrhages, and death. Unlike MDMA, PMA is much more unpredictable, and a dose that's harmless for one person might be life threatening for someone else. To give you an idea of just how volatile PMA is, despite MDMA dwarfing the former's share of the drug market, PMA is still responsible for twice as many death than its older and more reliable brother. Two of PMA's more common street names illustrate perfectly the kind of reputation it has among drug users: death and dr. death. The chances of meeting the grim reaper are significantly higher when users mix MDMA with PMA, which happens frequently in America since dealers over there often misleadingly label PMA ecstacy. This practice was, until recently, uncommon in Montreal, but apparently that might no longer be the case. Go out and buy your drug testing kit, folks. Make sure you know what you're popping, otherwise you might as well be playing a game of russian roulette.